After collecting victories in the first round of KSHSAA Class 1A-I Sub-State, St. Paul’s teams marched their way to the championship games Saturday, March 3. 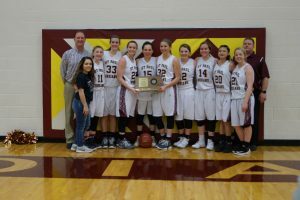 The St. Paul Lady Indians were named the KSHSAA Class 1A-I Sub-State Champions last night after defeating Southern Coffey County with no issue. From the start, these two teams were mismatched. St. Paul wasted no time establishing their presence in the first quarter by picking up an 18-4 score over Southern Coffey County. Again in the second quarter, the Lady Indians surpassed Southern Coffey County to advance their lead to 27-8. Execution continued to be key for St. Paul in the second half, as they punched 20 more points onto the board in the third quarter and left Southern Coffey County in the dust. The Lady Indians wrapped up the victory with a final score of 57-20 to become the 2017-18 KSHSAA Class 1A-I Sub-State Champions. Their record thus far stands at 20-2. This exciting victory was huge for senior Katelin O’Brien, as she led the team with 24 points and broke the 1000 career points mark. For the fourth time in the last five years, St. Paul’s Lady Indians will be making an appearance in the KSHSAA Class 1A-I State Tournament in Hays. Their first game will be against St. John-Hudson in the FHSU-Gross Memorial Coliseum Thursday, March 8, at 6:30 p.m.
“We will need to spend these next few days getting refocused and ready to play a tough opponent in St. John. We are excited to have this opportunity,” Tuck said. 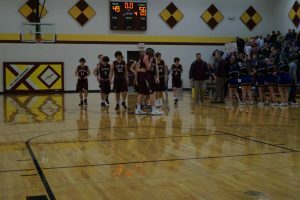 The St. Paul Indians were named the KSHSAA Class 1A-I Sub-State Runners-Up after an extremely close, fiery matchup against Southern Coffey County. Southern Coffey County jumped ahead in the first quarter with a score of 18-11, but the Indians were not tolerant for long. In the second quarter, St. Paul fired back with 17 points and found a way to limit Southern Coffey County’s offense to just seven points. With a 28-25 lead entering the third quarter, the Indians desperately needed to establish a safer lead. St. Paul scored an additional 12 and allowed nine in the third quarter, but there was still fight left in Southern Coffey County. As the clock winded down in the fourth quarter, Southern Coffey County had acquired a pace unmatchable by the Indians that earned them the 56-49 victory. 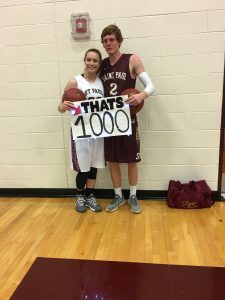 Despite the hard loss, senior Brenden Doherty had an excellent game with 25 solo points and crossed into the 1000-point club. The Indians finished the 2017-18 season with an overall record of 13-9.